Red Giant has just announced the release of Shooter Suite 12.6.1, bringing updates to PluralEyes, Offload, BulletProof and Instant 4K. Shooter Suite is a group of Red Giant’s plugins that grant “automation and workflow capabilities [needed] to offload, analyze, touch up and synchronize digital media destined for post”. It is comprised of several apps: PluralEyes, Offload, BulletProof, Denoiser II, Instant 4K, Frames, and LUT Buddy. The 12.6.1 update to Shooter Suite and PluralEyes 3.5 are available now as free download to existing owners of each program. Alternatively, Shooter Suite is available for $399, and PluralEyes is available stand alone for $199. Portland, OR – December 4, 2014 – Red Giant today released the latest update to its powerful Shooter Suite, a collection of purpose-built applications that give directors of photography, videographers, shooters and filmmakers the automation and workflow capabilities they need to offload, analyze, touch up and synchronize digital media destined for post. Headlining the Shooter Suite 12.6.1 release is PluralEyes 3.5.5 support for RED camera media. The go-to tool for audio and video sync automation, PluralEyes support for RED media ensures users can easily sync multi-camera and dual-system audio production media shot on RED cameras in a matter of seconds. Thanks to its outstanding accuracy, the new PluralEyes update even supports sync automation for spanned RED media, treating multiple files as a single logical clip. The update also enhances the overall export workflow and includes a new welcome video tutorial to help new users start using PluralEyes faster than ever before. In addition to the new PluralEyes update, the Red Giant Shooter Suite includes a number of improvements to the Offload, BulletProof and Instant 4K applications. The Red Giant Shoot Suite 12.6.1 release is free to existing 12.6 users and can be downloaded here or use Red Giant Link to update. PluralEyes 3.5 users will receive a notification upon software launch that an update is available. 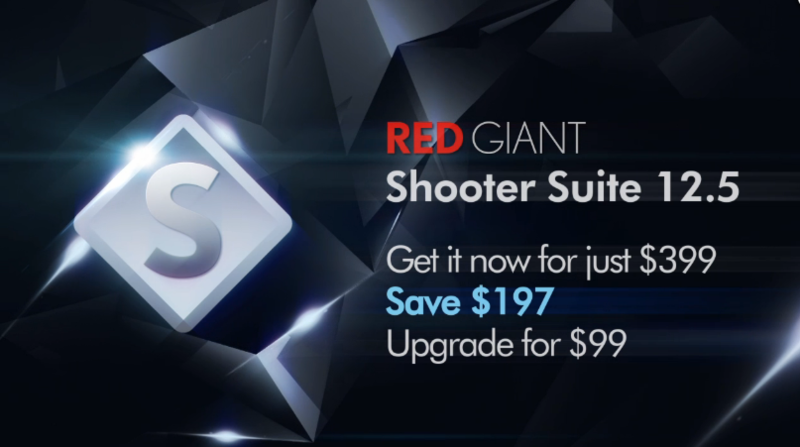 Red Giant offers the full Shooter Suite 12.6.1 package for 399.00 USD. Existing Shooter Suite users who fall outside the free update guidelines can update their existing applications for 99.00 USD. PluralEyes 3.5.5 is sold as part of the Shooter Suite Shooter Suite 12.6.1 and as a standalone product for $199.00 USD. Existing users who fall outside the free update guidelines can update their existing PluralEyes solo application for $79.00 USD.